Sooooo excited that I had the privilege of doing it! I had initially intended for all the characters to be cell shaded to simplify everything, but... I got a little carried away and over deadline :/ But I'm really happy with how it turned out! The actual poster will be slightly different because I have to make room for the event info. 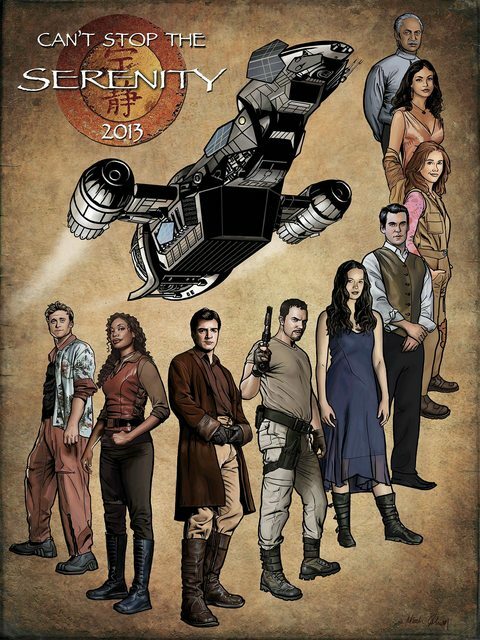 Check out the items signed by Summer Glau, Alan Tudyk and Morena Baccarin for Chicago Can't Stop The Serenity (CSTS) 2013 when they attented Wizard World Chicago Comic Con on August 2013. These 4 autographed photos of Summer Glau will be up for auction at the Chicago CSTS Event this year. They were graciously donated by none other than Summer Glau herself. So, lets everybody bid high on these items in honor of Summer Glau, our Big Damn Hero both on screen and off. Can't Stop The Serenity event.